After a day of tumultuous trading on Tuesday, with major indexes plunging, most investors seemed content to remain on the sidelines while awaiting the United States Federal Reserve's rate decision. Asian markets traded mixed yesterday, with any gains muted. The Straits Times Index gained 13.11 points, or 0.43 per cent, to 3,058.65. The Shanghai bourse ended 1.05 per cent lower, while Hong Kong traded 0.2 per cent higher. In Japan, the benchmark index lost 0.6 per cent on the day. This was despite positive signs from US Treasury Secretary Steven Mnuchin, who said the US and China are planning to hold meetings next month to negotiate a broader truce in their trade wars. "We are in the process of confirming the logistics of several meetings and we're determined to make sure that we use the time wisely, to try to resolve this," said Mr Mnuchin in a roundtable interview on Tuesday. Mr Dave Lafferty, chief market strategist at Natixis Investment Managers, said: "We suspect the market is getting a bit of geopolitical risk fatigue. While investors have been thrown about by tweets, tariffs, populism and government shutdowns, we believe these events are starting to lose their shock value." Trading was mixed on the local bourse, with a roughly even field of 177 gainers to 166 losers, as some 988.7 million shares worth $852 million changed hands. 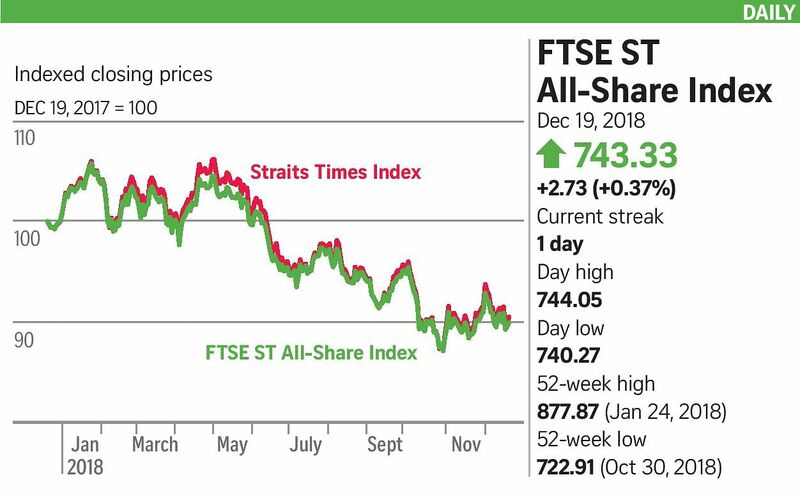 Heavily traded counters included Singtel, which closed flat at $2.96 on trade of over 21 million shares, and Golden Agri-Resources, which fell 1.96 per cent to 25 cents with about 34.4 million shares traded. Most Singapore-listed oil and gas, as well as offshore and marine, stocks traded sideways, as crude prices suffered another steep fall under pressure from burgeoning US supplies. This came after WTI futures crashed below the US$50 per barrel support level, and to their lowest in a year. Golden Energy, Vallianz and Sembcorp Marine closed unchanged, while Sembcorp Industries fell 0.39 per cent to $2.57. DBS Research had expected oil and gas stocks to regain ground after the Organisation of the Petroleum Exporting Countries and other oil producers agreed to a larger-than-expected output cut. But the cuts will not happen until next month. Now, market observers expect oil prices to fall towards the US$46 per barrel support, as production hits highs in the US, Russia and Saudi Arabia. Sentiment on oil and gas players may remain depressed in the meantime.